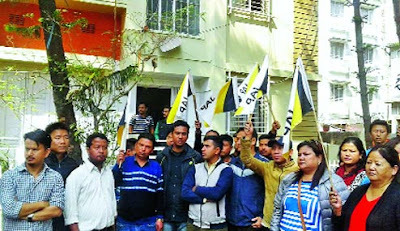 Eleven members of the student union at Kalimpong College who won elections as candidates of the Gorkha Janmukti Morcha and the Jana Andolan Party have joined the Trinamul Congress, the first defection engineered by the ruling party on a campus in the hills. In the union elections held on December 22, 12 seats of class representatives went to the JAP and 10 to the Gorkha Janmukti Vidyarthi Morcha. The JAP formed the union whose total strength is 22. However, today, nine class representatives of the Vidyarthi Morcha and two of the JAP filed affidavits, saying they had joined Trinamul. Around 70 supporters of the JAP's youth wing today demonstrated in front of minister Gautam Deb's residence in Siliguri for two hours today, alleging that some Trinamul leaders had "abducted" two of its class representatives and kept them at a hotel at Second Mile in the town. The agitators left when they were told that the minister was away in Calcutta. The hill unit of Trinamul has denied the allegations made by the JAP. The ruling party had managed to poach elected representatives of other parties elsewhere in the state to grab panchayats and municipalities. However, this is the first time that Trinamul has engineered defections in a hill college. Trinamul has 11 members at Kalimpong College now and can form the union, if the JAP and the Morcha representatives don't come together. "The JAP and the Morcha together have 11 members and if they unite against Trinamul, the college authorities will take a decision through toss on who will form the union. However, if Trinamul manages to get on board one more class representative, there will be no need for a toss" said a source.